From the summer edition of Plentiful Redemption, the Redemptorists’ quarterly newsletter. Click here to read the newsletter online (PDF). By Rev. Richard Bennett, C.Ss.R. Like many people, I can be a nervous fidget. Think for a moment, how many times you’ve witnessed a friend or a teacher twirl their hair with their finger. Perhaps your boss or colleague plays with his or her pen. Some folks chew gum, some grind their teeth, still others bite their nails. These quirky, nervous habits seem to be rather common. No matter what the behavior, it seems to happen without thinking. This fact hit home with me during a recent conversation with a friend. She was talking about some observations she’d made about some unique Redemptorist habits. Have you ever noticed your reaction when someone points out something in your character or personality? Typically, our first reaction is, "No, that’s not true!" But once we honestly reflect a little … there may be more truth in our friend’s statement than we were first willing to admit! 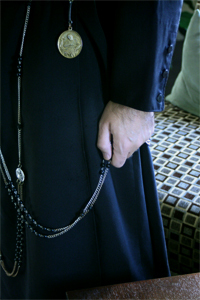 My friend noticed, time and time again, that Redemptorists have a habit of playing with the rosary beads that are part of our religious habit. Of course, I thought she meant that she often saw us praying with our rosary beads. True. She had indeed seen our men praying the rosary. But we also seem to have a habit of fiddling with those rosary beads, too. We hold them in one hand while preaching a sermon during a parish mission. They run between our fingers while gathered in a circle, laughing and telling stories with fellow Redemptorist priests and brothers. We grab for those beads while speaking to a group of retreatants, or while addressing an assembly of high school students. Since I was a little boy, the soft gentle assurances from my mother always made everything turn out alright. "It will work out. Don’t worry," my mother would say. For us Redemptorists, our common “rosary twitch” may serve as a subtle reminder from Our Blessed Mother that “everything is going to be OK."
Men who are looking at religious life today routinely ask me, "What makes the Redemptorists distinct from other orders?" I tell them that it’s very difficult to want to be a Redemptorist and not have a deep love for and devotion to Mary. From the time St. Alphonsus entrusted the congregation to her protection until the original icon of Our Mother of Perpetual Help was given to us in 1866 by Pope Pius IX, Redemptorists have always held Mary in highest esteem. It was a small image of that same icon, leaning up against my grandmother’s perfume bottle, that gave me the little push I needed to enter the Redemptorist seminary in 1987. Throughout my life, I have fiddled with those beads, time and time again, and felt that same assurance. Like Mary, we are called to be prophets of hope to those who feel most abandoned. Sometimes we proclaim that message with words. And sometimes we just reach for our beads. Fr. Bennett is vocations director for the Baltimore Province.